Having sourced the shu uemura “Premium Black Gown” False Eyelashes yesterday I couldn’t stop feeling intrigued by the idea of buying a pair. Seattle’s Nordstrom sells these for $52. More than I need to spend on a weird whim. 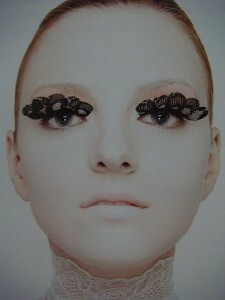 I wondered if I might buy the eyelashes on eBay and I spotted a site for them right away. The downside is the winning bid was $41.80 plus $8.99 Shipping. Has anyone tried attaching a fragment of lace to a conventional pair of false eyelashes? Posted in Fashion, Writing. Bookmark the permalink.